Omar Barghouti in 2016. A Qatari-born Palestinian, Barghouti is a leader of the international boycott, divestment and sanctions movement against Israel known as BDS. Barghouti was at Ben Gurion International Airport in Israel on Wednesday when airline staff informed him that he wouldn't be flying despite holding valid travel documents, according to the Arab American Institute, a Washington-based advocacy group that arranged the trip. He was told that U.S. immigration officials had ordered the U.S. consul in Tel Aviv to deny him permission to enter the United States. "Barghouti was not provided an explanation for his denial of entry beyond 'immigration matter,' " the Arab American Institute said in a statement. The group said Barghouti typically faces travel hurdles from Israel – not the United States. He has a master's degree from Columbia University and spent a decade in the U.S. in the 1980s. Barghouti had scheduled a speaking tour that included stops at Harvard and New York University, meetings with Washington policymakers and an appearance at a bookstore in Philadelphia owned by professor Marc Lamont Hill, whose CNN pundit contract was terminated last November over controversial remarks he made in support of Palestinian rights. At the end of the trip, Barghouti planned to attend the wedding of his daughter, who lives in the United States. BDS supporters see Barghouti's movement, which draws inspiration from a similar campaign against apartheid-era South Africa, as a nonviolent way to protest Israel's military occupation of the West Bank, construction of settlements which most of the world views as illegal and other human rights concerns. The approach has experienced a surge in popularity in recent years, with dozens of student, academic and labor groups announcing support for BDS, and artists such as Lorde and Lauryn Hill canceling shows in Israel. Those moves worry Israel, which considers BDS a cover for a more nefarious campaign to delegitimize or even destroy the country. BDS critics on Twitter had blasted Barghouti's speaking tour as giving a platform to anti-Semitism. In the United States, more than two dozen states have adopted laws to punish companies that boycott Israel. This week, according to a report in The Hill, House Republicans are launching a discharge petition to force a vote on Senate legislation "that would allow state and city governments to penalize entities that seek to boycott, divest from or sanction Israel." Arab American Institute President James Zogby said in the statement that denying Barghouti entry deprives Americans of an important voice in the debate over BDS. "It is disturbing that policymakers and the American people will not have the opportunity to hear from Omar directly about his views," Zogby said. Barghouti, who lives in Israel with permanent residency status, previously has faced obstacles to traveling. In 2016, Israeli authorities refused to renew his travel documents, citing evidence that Barghouti spent most of his time in the West Bank, Israeli outlets reported. Israeli Interior Minister Aryeh Deri was quoted as saying Barghouti is "using his resident status to travel all over the world in order to operate against Israel in the most serious manner." In that instance, Barghouti told the newspaper Haaretz that the impediments to his travel were "clearly political" and potentially "a first step toward revoking my permanent residency." He's also reportedly faced travel denial because of an Israeli investigation in connection with alleged tax evasion. The ban was temporarily lifted in 2017 and Barghouti traveled to Yale University to receive the Gandhi Peace Award from a Connecticut activist group. Yale issued a statement stressing that it was unaffiliated with the award but honors requests from the community to "invite speakers and groups to campus in accordance with our mission of fostering the free exchange of ideas." 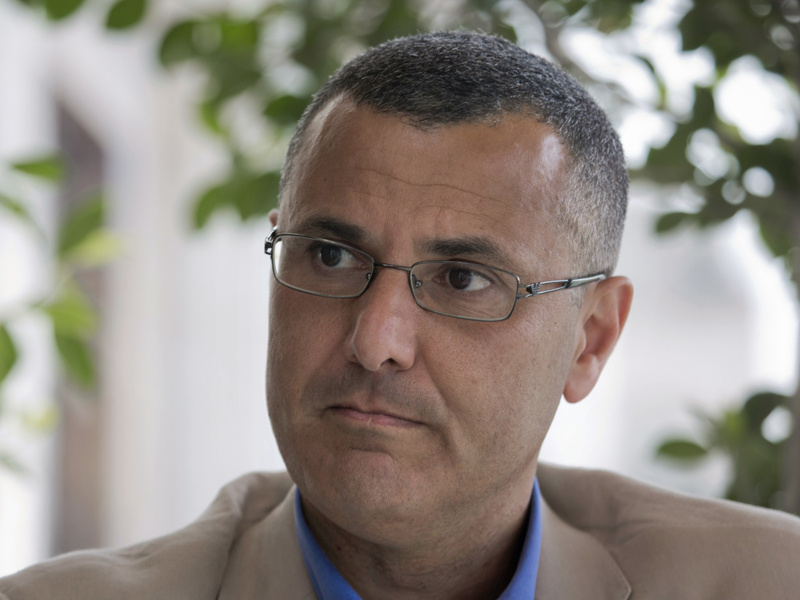 In February, the watchdog group Amnesty International demanded that Israel "end the arbitrary travel ban on human rights defender Omar Barghouti." Israel later issued Barghouti a travel document. He holds a U.S. visa that's valid through January 2021. Barghouti is among a growing list of international figures barred entry to the U.S. by the Trump administration. Earlier this month, U.S. authorities revoked the visa of the International Criminal Court's chief prosecutor, reportedly over her attempts to investigate alleged war crimes in Afghanistan. Last month, dozens of women – primarily from African and Middle Eastern nations that fall under the administration's travel ban – were denied visas to attend a United Nations women's conference. In accordance with a 70-year-old treaty, the United States, as host nation, is obliged to admit visitors to the U.N. headquarters in New York. In some cases, there's a clear political or security backstory to the denial of entry. In others, the reasons are opaque. In 2017, an Afghan all-girl team of students that was invited to a robot-building contest was denied entry. U.S. authorities eventually issued visas for the girls after a backlash from human rights groups. NPR correspondents Daniel Estrin in Jerusalem and Michele Kelemen at the State Department contributed to this report.